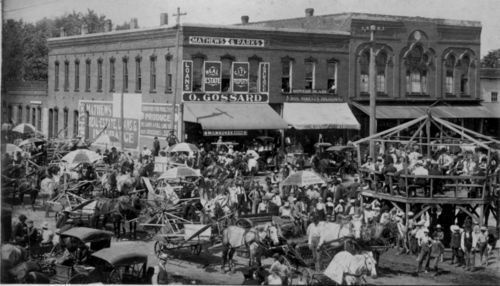 A view of a street fair at the intersection of Commercial and 4th Streets in Oswego, Kansas. This photograph was taken just at the conclusion of an afternoon concert performed by the band in the temporary bandstand on the southeast corner of the intersection. Also visible are nearly a dozen horse-drawn reapers (some have umbrellas with advertisements), many spectators, horse-drawn carriages, utility poles and power lines, and buildings and businesses (including the second-floor offices of the "Oswego Blade" newspaper) along the city street.